Rev. 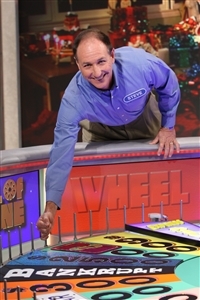 Steve Price, co-pastor of Harvest UMC, Lakewood Ranch, takes his turn at the famous "Wheel of Fortune" icon during a taping of the show in October. Photo courtesy of "Wheel of Fortune." LAKEWOOD RANCH – If you tune into CBS television’s “Wheel of Fortune” Tuesday, Nov. 26, you’ll see a face familiar to many in the Florida Conference: Rev. Steve Price, co-pastor of Harvest UMC. Producers of the long-running game show decided that Price was right for a contestant’s spot on the show after he auditioned in Clearwater last spring. 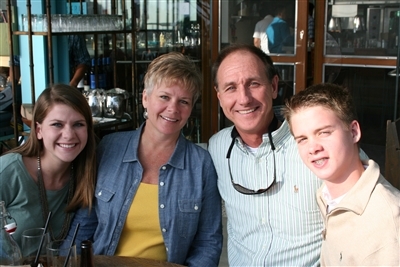 With his wife and co-pastor, Catherine Fluck Price, and their children, Shelby and Sid, he flew out to Los Angeles in October for the taping of a show that will air at 7 p.m.
An excited Harvest congregation is planning a “watch party” at The Ranch Grill, 14475 State Road 70, Bradenton, a restaurant owned by church member Darrin Simone. Everyone is invited, and a portion of the proceeds from meals sold will go to Harvest’s Pack-a-Sack ministry that provides weekend meals to 100 children at Samoset Elementary School. The Prices will be there by 6 p.m. In addition, Price was chosen to write a blog about his experience, which can be accessed beginning Monday, Nov. 25, at www.wheeloffortune.com/contestants/contestantblogs. Price said he has been a longtime fan of the show, which dates to 1975 and offers contestants a chance to strategically guess letters to fill in popular phrases or sayings and earn cash prizes by being the first to identify a phrase. Woolery was later replaced by Pat Sajak, whom Price met while in Los Angeles. As an adult, Price has continued watching the show, often with his family around him. About two years ago, his son, then a high school freshman, admired his dad’s prowess and decided to sign him up for an audition. Price said he sent in an application with a short video that talked about why he would make a good contestant. In May, he was invited to an audition in Clearwater and later to Los Angeles. From left, Shelby, Catherine, Steve and Sid Price enjoy family time in Los Angeles as they support Steve in his appearance on "Wheel of Fortune." Photo from the Price family. He said he was able to watch the taping of six different shows and enjoyed his behind-the-scenes look. The staff works to make the experience enjoyable for contestants as well as viewers, he said. Price and his family agreed to keep the outcome of his participation a secret until the show airs. Although his experience as a church pastor accustomed to speaking in front of crowds was helpful, Price said, he still found it more difficult to stay focused on a TV show set than as a TV viewer.